Keeping Christmas by Dan Walsh is a perfect read in the lead up to Christmas. Stan and Judith are ’empty nesters’. Their three children are grown up and have moved several states away. None of them could come for Thanksgiving, and then they individually dropped the bombshell – none of them could afford to come for Christmas. Stan takes it in his stride. Judith hits rock bottom. Dan Walsh covers the theme of depression sensitively. He shows how quickly one can reach the bottom of the pit, in spite of having the loving support of a spouse and friends. And how hard it is to lift oneself out of that pit. The theme of friendship runs throughout the novel. There is the male bond of Stan and Barney, and the female one of Judith and Betty. Both friendships are realistically portrayed as the women talk and the men ‘do’ friendship. Families are of vital importance. Dan Walsh clearly demonstrates this within Keeping Christmas. The love bond with the family is very strong – one hurts and they all hurt. Christmas traditions and making memories are central to the novel. The run up to Christmas should be a family time. It’s about “having fun and making memories.” Dan Walsh shows how a society that has never been so well connected with technology is actually a fractured society. People meet together but are more concerned with their phones and their tablets than with actually interacting with those around them. Whilst making memories is important. Wallowing and living in the past can be toxic. Judith realises this, “Christmas memories were something to cherish and smile about, but cling to them too tightly and they’d turn sour and maybe even make you bitter.” However depression is an illness that is not easy to combat. The theme of love stretches throughout Keeping Christmas. It is a love that practices self sacrifice. It is a love that binds people together. It is an extravagant love. 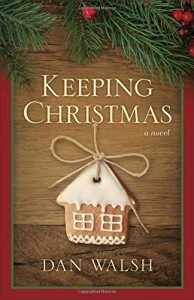 Keeping Christmas is a realistic and warm novel. It will get into your heart. It reminds the reader that there are seasons in life that change but overall there is a love that binds and will not let go.